Since its opening in Rushden Mrs. Webb had been a member of the clinic which has been opened at the Y.M.C.A. on alternative Fridays. Infant WelfareThe second annual winter tea-party of the Rushden and Higham Ferrers Infant Welfare Centre was held at the Queen-street Schools, Rushden, on Wednesday afternoon, when a large number of parents and children spent a thoroughly enjoyable time. Tea was provided, also crackers and toys. Rushden Infant Welfare Centre, which won national recognition by retaining the Parentcraft Shield and winning the Rhondda Shield, held an "open afternoon" for those interested in its activities. Mrs. O. 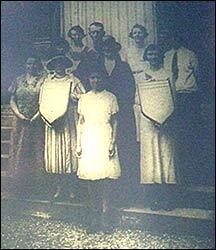 A. H. Muxlow (Chairman) is seen holding the Parentcraft and Mrs. E. Desborougb the Rhondda Shield, which she secured for the Centre by her essay. The president (Mrs. F. J. Sharwood) is in the centre of the picture. Infant Welfare Centre activities at Rushden over the past 12 months were outlined at the 17th annual meeting held at the Waverley Hotel, with Coun. Mrs. O. A. H. Muxlow, C.C., presiding. The secretary (Mrs. C. A. Sanders) reported that the centre had been open for 47 sessions. The total number of weighings was 2,761 and the doctor had been consulted by the mothers 941 times. Each week voluntary helpers were present for the sale of baby foods, cod-liver oil, orange juice and cups of tea; other duties included regulating the perambulator traffic and supervising the toddlers at play. Expenses during the year included the cost of taking 75 mothers to the Ritz cinema to see the film “Life with Baby”; a New Year party for 150 mothers and children, and the purchase of new toys and another pair of scales. Dr. Goodchild thanked all the helpers for their interest and regular services. It was stated that the centre was now being held again at Queen Street Independent Wesleyan Sunday School after its temporary transfer to the Moor Road Scools. Mrs. Muxlow was re-elected chairman and Mrs. C. Faulkner succeeded Mrs. F. E. Hutton as president. Present were: Mesdames A. Muxlow, Faulkner, Hutton, H. Burfield (registrar), D. Draper, W. Flood, D. E. Foster, L. Perkins, C. A. Sanders (secretary) and E. Sugars, with Dr. Goodchild (the Centre M.O. ), Miss Millgate and Miss Shiel (health visitor). RUSHDEN Infant Welfare Centre yesterday presented one of its nurses, Miss P. Wallis. with flowers and a pen and pencil set to mark her 12 years' service to the centre. She is leaving the Rushden clinic to work in the Kettering area. Before the presentation a colleague, Nurse G. Millgate, described Nurse Wallis' work in the area and afterwards Mrs. A. U. Muxlow presented her with her pen and pencil on behalf of the centre helpers and mothers. Thanking everyone. Nurse Wallis estimated that she had looked after 200 babies during her stay at Rushden. The presentation was made during the normal clinic hours so that as many mothers as possible were able to attend. 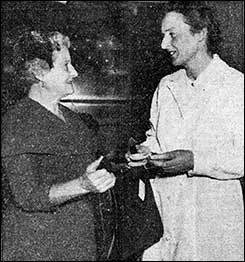 Mrs. F. Parsons presenting a travelling clock and a handbag to Miss P Wallis, to mark her departure from the Irchester Welfare Clinic after 12 years as a nurse.